Remove seeds of nellikka and chop finely. Add chopped nellika to a deep bottom pan with 1/2 cup water, tumeric powder, salt. Boil nellika till soft. Grind grated coconut, green chilli, garlic, ginger and cumin seeds to a smooth paste. Add this paste to the cooked nellika. Cook for 5-6 minutes in low flame. Remove from fire. Heat oil in another pan, splutter mustard seeds, curry leaves and red chilli. Add this seasoning to the gravy. Serve with rice. Very unique idea.I used to make only chutney with goosberry. nice blog jais, following you. Goose berry curry wow! very innovative recipe.Thanks for visiting my blog! OOh! That's a very yummy curry, never heard of this, looks lovely. yummy curry...nice recipe dear,thanks for sharing. New to me... But looks delicious and sounds interesting..
Nellika curry kollam. Nice one. Wow, never made a curry out of amla (gooseberry). Delicious curry!! Evide nellikka kittumarunenkil njan ee curry ennu undakkiyene :) Never tasted this curry before, but am sure that it would be super delicious with rice..Naattil pokumbol urappayum try cheyyum..Bookmarked!! terribly terrific recipes...mouthwatery n inviting color. Tangy curry looks irresistible, mouthwatering here..
Nice recipe. 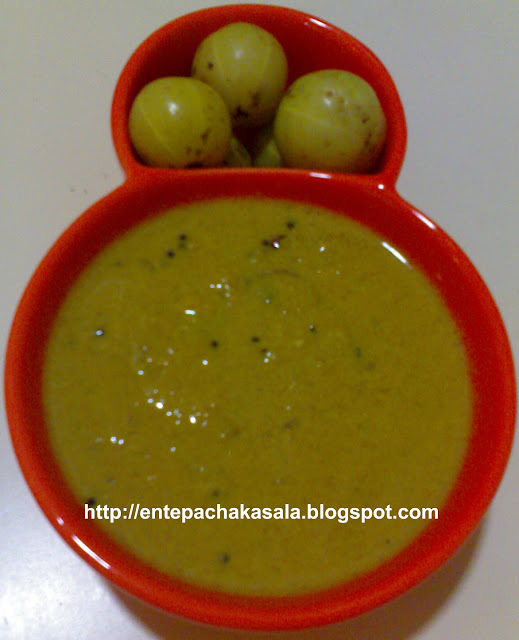 I have used nellika with sambar. will give this different recipe a try! gooseberry is a healthy fruit that I try to use in various ways; this one I haven't tried but would love to, since there is a packet of nellikka in my freezer.